Reduce the appearance of fine lines and wrinkles with our 3-step anti-aging regimen, containing a proprietary blend of antioxidant nutrients and essential vitamins infused into a polyphenol-rich muscadine grape blend for powerful age-defying results. The steps in the Anti-Aging Regimen were designed to work together to improve skin texture and firmness and to reduce the appearance of wrinkles. 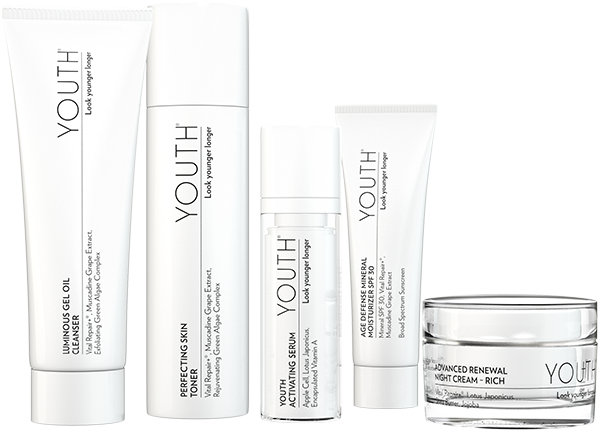 Our revolutionary Youth Complex is in every single product, providing treatment benefits in each of the three simple steps. YOUTH products are all 100% vegan and cruelty free. Step 3 Day: Age Defense Mineral Moisturizer - Naturally derived zinc oxide provides chemical-free SPF 30 broad spectrum UVA/UVB protection. Vitamins and botanicals moisturize your skin and improve skin tone. Step 3 Night: Advanced Renewal Night Cream - This targeted night repair cream supports your skin's cell renewal process. A proprietary botanical blend helps support collagen and elastin production to make skin appear younger looking, smoother, and more luminous. Available in Light or Rich formulas. Age Defense Mineral Moisturizer - Apply a nickel- to quarter-sized drop of moisturizer onto fingertips, dot face all over, and smooth in. You may notice a slight whitish tint, which will dissipate once moisturizer is fully absorbed. Reduce the appearance of fine lines and wrinkles with our 3-step anti-aging regimen, containing a proprietary blend of antioxidant nutrients and essential vitamins for powerful age-defying results.